"Animal Angles" [features an animal related to the magazine's monthly theme], Odyssey, 1998-2006, about 70 columns. "Quote of the Month" [presents an activity—often a puzzle or code—that reveals a quote tied to the magazine's monthly theme], Cobblestone, 1998-2004, about 30 columns. "Odyssey Online" [discusses activities in cyberspace related to the magazine's monthly theme], Odyssey, 1996-1997, about 10 columns. "Einstein’s Refrigerator? The New Green Machine!" 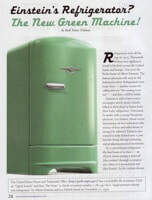 [Einstein’s refrigerator], Odyssey, November/December 2009. "SIMPLY Weird" [Internet activity], Odyssey, January, 2008. 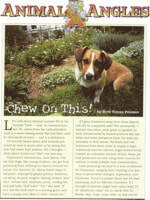 "Beware of Hitchhikers" [invasive species], Odyssey, April 2007. "Feat of Clay" [animation], Odyssey, October 2005. "Sweet Dreams" [chocolate], Odyssey, Februrary 2005. "Daniel Gropper Gauges the Weather," "The National Weather Service," and "$1 Million Per Mile", Odyssey, February 2004. "Belle of the Mall" [statistics], Odyssey, December 2003. "What Does He Know? 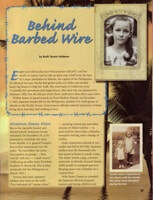 An Interview with Spymaster E. Peter Earnest," Odyssey, September 2003. "Polymath Predictions: An Interview with Stephen Jay Gould," Odyssey, December 1999. "Setting Your Sights on Space" and "Hold Still!" [Mapping the Planets], Odyssey, October, 1995. "Chris Slough: A Teen Who Is Taking Charge" [Earth Day and environmental activism], Odyssey, April 1995. "The Saga of Sunforce 1" [long-distance race of solar-powered cars], Odyssey, June 1994. "Explore Your Vision—and Win!" [NSF ExploraVision competition], Odyssey, October 1993.
camps during World War II], Cobblestone, September 2007. "Hard Work Is the Only Escape" [Edith Wharton] and "America's Sweetheart Goes to War"
[Mary Pickford], Cobblestone, March 2006. "Magic Bean Soup" [Congress], Cobblestone, February 2005. "African American Sailors" [Civil War], Cobblestone, January 2004. "The Okie School" [Dust Bowl], Cobblestone, April 2003. "Naomi Shihab Nye and the Power of Stories" [Arab Americans], Cobblestone, May 2002. "So I Got Involved" [NAACP], Cobblestone, February 2002. "'I Can Be Useful': First Ladies and Their Causes," Cobblestone, September 2000. "Mission Barely Possible" [La Salle expedition], Cobblestone, October, 1999. Highlights for Children, September 1999. "The DREDful Scott Decision" [Supreme Court’s Dred Scott v. Sandford case], Cobblestone, October 1998. "The Generals" [Antietam], Cobblestone October 1997. 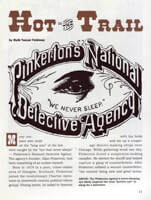 "From Gold Nuggets to the Golden Spike" [California], Cobblestone, September 1997. "The Scoop on the Media and Elections," Cobblestone, October 1996. "The Era of Good Feelings" [James Monroe], Cobblestone, September 1996. "Spacious Dreams" [Japanese Americans], Cobblestone, April 1996. "A Lifelong Interest: An Interview with Hugh Gregory Gallagher" and "Our Especial Treasure" [Franklin Delano Roosevelt], Cobblestone, April 1995. "The Traveling Recluse" and "Guess What" [Emily Dickinson], Cobblestone, March 1995. "Thacher's Wampum" and "Historic Moments in a 10,000-Year Heritage" [Native Americans of the Northeast], Cobblestone, November 1994. "Music's My Language" [Louis Armstrong], Cobblestone, October 1994. "A Classical Education" and "Life at Home" [Sam Houston], Cobblestone, September 1994. 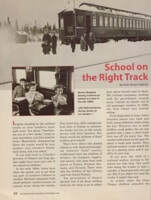 "Canada's Travelling Schools", Keeping Track [published by CN North America in English and French], September 1994. "Canada: Au Temps des Voitures-Écoles" and "Sudbury - White River, A Bord de L'Autorail des Vacances" [Canadian school car], La Vie du Rail [Train magazine published in Paris], June 8-14, 1994. "From Jim Crow to Justice" and "Mr. Civil Rights: Thurgood Marshall," Cobblestone, February 1994. "Our 101st Senator," "350 Years of Voices," and "The Supreme Court Needs You!" [role of children in government], Cobblestone, December, 1993. "Under the Ooze at Ozette" [Native Americans of the Pacific Northwest], Cobblestone, November, 1992.